On Tuesday, The White House announced that they are refusing to provide any documents relative to the investigation of Michael Flynn (Donald Trump's former national security adviser). 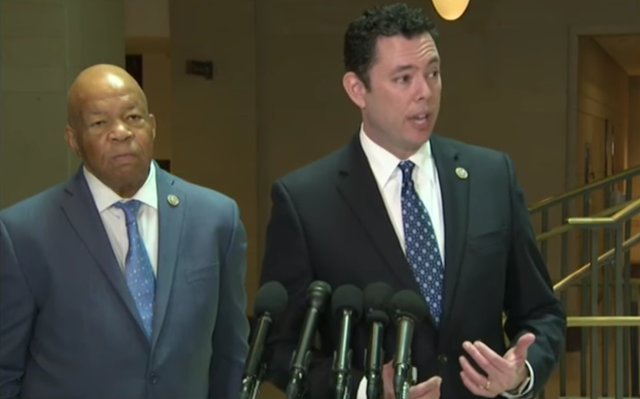 Also, earlier today, Jason Chaffetz (R-UT), Chairman of the House Oversight Committee and its ranking Democrat, Elijah Cummings (D-MD) held a brief press conference. The video above is a portion of that exchange. A portion of it is transcribed here along with a partial nonverbal analysis. Manu Raju: "Do you believe that Michael Flynn broke the law from either not disclosing it, these payments on the security clearance, or not getting permission for getting these, ah, foreign payments?" Jason Chaffetz: "Ah, personally I see no information, or no data to support the notion that General Flynn complied with the law - and that is - he was supposed to seek permission and receive permission from both the Secretary of State - and the Secretary of the Army prior to traveling to Russia to - not only to accept that payment to - but to engage in that activity. I see no evidence that he actually - did that..."
The image above was captured during 0:13 of the above video. Note Representative Chaffetz's forehead. Its left half is dramatically contracted upward, secondarily also raising his left eyebrow. This is strongly indicative of disbelief. Throughout the entire time he's speaking and for a second or so afterward, Rep. Chaffetz's left forehead and eyebrow maintain this configuration. At this same moment, Representative Cummings is experiencing and displaying three emotions - anger, contempt, and disgust - the Venn diagrams of these all overlap. Note the extreme tightening of his mid-face, the greater contraction/elevation of his right mid-face, the flaring of his nostrils, clenching of his jaw, dimpling of the anterior aspect of his chin, the thinning of his lips (particularly the upper lip), and the lowering of his inner (medial) eyebrows.